Full Belly Farm is a certified organic farm that produces vegetables, herbs, nuts, flowers, and fruits in California’s beautiful Capay Valley. Since 1985, partners Andrew Brait, Judith Redmond, Paul Muller, and Dru Rivers have been producing wholesale and retail products for restaurants, farmers markets and their Community Supported Agriculture (CSA) members. In addition to growing and marketing over 80 different crops, Full Belly integrates sheep and egg-laying hens into their model on the 400-acres of diversified farmland. Full Belly also hosts a variety of agritourism activities including the acclaimed Hoes Down Harvest Festival, farm-to-table dinners, weddings, summer camps, educational tours, and school group visits. 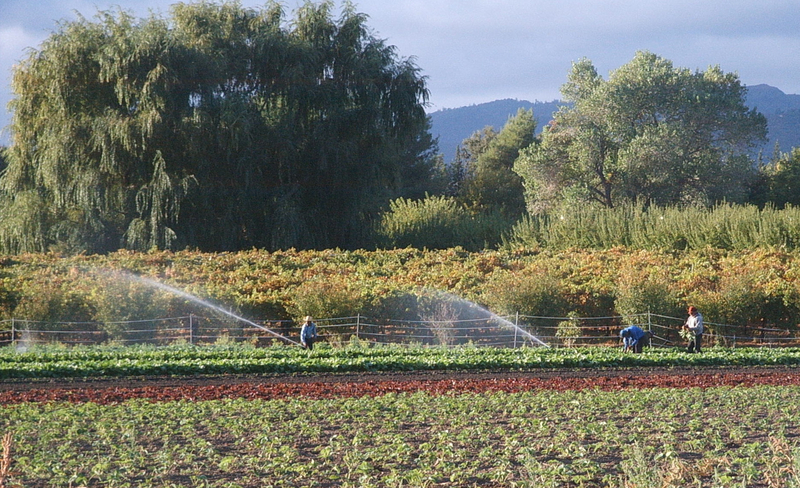 Full Belly Farm demonstrates a number of exemplary sustainable agriculture practices that strengthen their operation. Grazing livestock play an integral role in soil fertility and nutrient management, as does the use of compost, cover crops and crop rotations. Hedgerows and other wildlife-friendly practices assist with decreased nitrate runoff and attraction of beneficial insects and pollinators. Full Belly also supports the development of local and regional food systems by opting to sell their produce within a 120-mile radius. One element of diversity at Full Belly Farm is their value-added food processing through sun drying fruits and vegetables. The farm owns a wheat mill that they use for making stone-ground flour out of heirloom grains, and a portion of their almonds get processed locally into almond butter. They also sell flower bouquets and yarn made from their sheep wool. The value-added component allows for Full Belly Farm to employ about sixty year-round employees. Their human resources team includes all four owners and additional staff that handle payroll and accounting on-site. Full Belly has also been able to implement renewable solar electricity generation as one of their many holistic stewardship efforts. In 2004 Full Belly installed their first solar panels with a capacity of 17 kilowatts (kW) of electricity. Qualifying for a California tax rebate on this first project was a key element in the project’s economic viability. 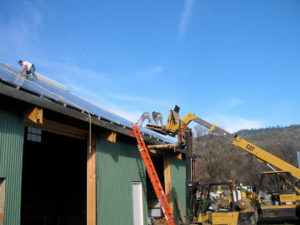 In 2012 Full Belly installed additional solar panels and started the construction of an on-site machine shop. The machine shop was built with a roof to match solar specifications and this development was made possible by a Renewable Energy System and Energy Efficiency Improvement grant from the USDA Rural Development Agency’s Rural Energy for America Program (REAP). With help from the REAP grant Full Belly Farm was able to add an additional 12.5 kW to net 35 kW of electricity. 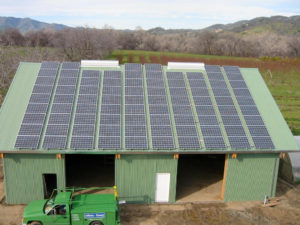 CalCAN supported the 2012 passing of Senate Bill 594 which removed barriers to on-site renewable energy production on farms throughout California. Since the time of the REAP grant the electricity generated by these solar panels has come to replace 89% of the previous electricity consumption. This is then net metered into PG&E’s power grid and used for post-harvest storage, ice machines, the mechanics shop and their packing shed. Future goals of Full Belly’s holistic stewardship practices include the generation of additional solar power along with the construction of a long- awaited commercial kitchen and event center. These exciting developments will expand the opportunity for on-site renewable energy, value-added products and agritiourism. Most recently Full Belly was awarded an additional $20,00 from the USDA REAP program. This grant will pay for 50% of the installation of an additional 40 kW worth of solar panels to supply power for the freezers, the pump for the packing shed water, and all of the coolers. Each week the farm donates multiple CSA boxes to their Good Food Community Fund and Full Belly Farm also has an active sustainable agriculture internship program that serves to educate the next generation of holistic stewardship practitioners.